Malta is an island country in Europe. It is near the center of the Mediterranean Sea, south of Sicily. The capital of Malta is Valletta. About 400,000 people live in Malta. Malta is one of the most densely populated countries in the world. Because of this, it has many cities and towns that grew into each other over time. The largest of these is possibly Birkirkara. Malta has two official languages, Maltese and English. A majority of the people of Malta can be able the two languages. Malta had its own currency, called the Maltese Lira until 2008. The Maltese Lira was better known as the Maltese Pound because of the strong links to the United Kingdom. One Maltese Lira consisted of 100 cents. In 2008 Malta joined the Euro countries in adopting the Euro as the National Currency. People have lived in Malta since at least 5200 BC. The island has some key archaeological locations dating from early times. Malta became well known as the base of the Knights of St John. They moved to Malta after being forced to leave Palestine and then Rhodes, in Greece. The knights and the Maltese people survived a great attack by the Turks. The history of the knights at Malta continued the strong Roman Catholic beliefs in the country that were started by the Norman and Spanish rulers. In 1798, Napoleon took control of Malta. The French rule was not popular and in 1800 Maltese rebels invited the English Royal Navy to come to the island. This lead to 200 years as a British colony and independent Commonwealth member. During the Second World War, Malta was again attacked this time by the Axis forces. The entire island was symbolically given the George Cross for heroism. 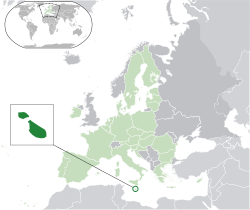 Malta became independent in 1964 and a republic in 1974. In 2004 Malta joined the European Union and in 2008 Malta joined the Euro. ↑ "Malta: General data of the country". Populstat.info. http://www.populstat.info/Europe/maltag.htm. Retrieved 14 November 2010. ↑ 4.0 4.1 4.2 4.3 "Malta". International Monetary Fund. http://www.imf.org/external/pubs/ft/weo/2011/01/weodata/weorept.aspx?sy=2008&ey=2011&scsm=1&ssd=1&sort=country&ds=.&br=1&c=181&s=NGDPD%2CNGDPDPC%2CPPPGDP%2CPPPPC%2CLP&grp=0&a=&pr.x=30&pr.y=3. Retrieved 30 April 2011. ↑ Census of Population and Housing 2005: Preliminary Report. Valletta: National Statistics Office. 2005. ISBN 978-99909-73-38-9 . http://www.nso.gov.mt/statdoc/document_file.aspx?id=1653. Retrieved 20 September 2011. This page was last changed on 22 August 2014, at 21:03.